This book takes place in the middle of winter in a place called Dresden, Germany. The main characters name is Lizzie her mom is a zoo keeper. Her mom and her brother Karl have bonded so much with this elephant from the zoo that it stays in their garden. In the story the family is living a normal day ,people are coming and looking at Marlene (the elephant) and all of a sudden bombers come and bomb the city. Thousands of people hurry to leave all going to the same place. While finding their way they fight to stay alive and avoid Russian solders at all costs. The theme of the book is family always sticks together. In the book when the city got bombed Lizzie's mom knows how to get to where all the people are going through a short cut. Even though not everyone in Lizzie's family had faith, they stuck together and went through the short cut. Also when they were walking through the short cut Karl was getting tired and couldn't go on much longer. Even though Marlene (the elephant) had never been rode they put Karl on her back because they knew it was the only option so they could stick together and not freeze or starve. This book could of happened because the red army was moving in to attack Germany and Lizzie and her family were moving away from that. This book could also of happened because Winters in Germany can get below freezing and when they got bombed it was very cold outside. 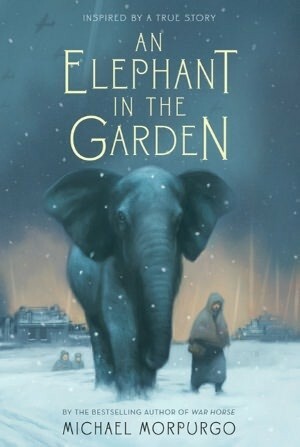 "An Elephant in the Garden Cover Image." Orange Marmalade. N.p., 27 Feb. 2014. Web. 15 Dec. 2014.